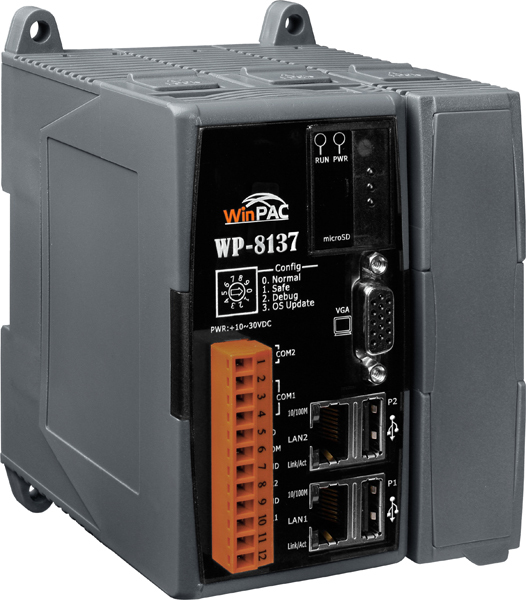 The ISaGRAF WinPAC-8137 is one of ICP DAS USA's new generation of ISaGRAF. This device is equipped with a 520 MHz PXA270 CPU, and an array of input and output ports (VGA, USB, Ethernet, RS-232, RS-485). With an I/O slot, you can integrate high performance parallel I/O modules. ModbusTCP/IP Slave Two Ethernet ports (LAN1 & LAN2) support up to 32 connections. If the PAC uses 1 connection to connect each PC/HMI, it can connect to up to 16 PCs/HMIs; If the PAC uses 2 connections to connect each PC/HMI, it can connect to up to 32 PCs/HMIs; If one of the Ethernet port malfunctions, the other one can still be used to connect to the PC/HMI. I-7000 & I-87k RS-485 Remote I/O One of COM2 ~ 3 supports I-7000 I/O modules, I-87K base + I-87K Serial I/O boards, or RU-87Pn + I-87K High Profile I/O boards as remote I/O. A max. of 255 I-7000/87K remote I/O modules can connect to one PAC. UDP Server & UDP Client: Exchange Message & Auto-report LAN1 or LAN2 supports the UDP Server and UDP Client protocols allowing messages to be sent/received to/from a PC/HMI or other device. For example, data can be automatically reported to the InduSoft's RXTX driver. TCP Client: Exchange Message & Auto-report LAN1 or LAN2 supports the TCP Client protocol allowing messages to be sent/received to/from a PC/HMI or other device that supports the TCP server protocol. Ex: automatically report data to InduSoft's RXTX driver, or to connect a location camera. GPRS/SMS Enable the I-8212W (2G/3G) card allowing short messages to be sent/received to/from or to access a dial up connection to link to the Internet and using a GPRS connection to send an email or communicate with remote stations using the "FTP Client"or the "TCP Client"/"UDP Server"/"UDP Client" protocols. Hot-Swap and Redundant System This redundant system has setup two "Active IP" address point to the active LAN1 and LAN2 ports always. One or more PC/HMI/SCADA can communicate with this redundant system via one of the two given active IP. So the PC/HMI/SCADA can access to the system easily without any notice about which WP-8xx7 is currently active. I-87K high-profile I/O cards to support the hot-swap application. If the I/O card is damaged, the maintenance person just takes one good-card with same model number to hot-swap the damaged one without stopping this redundant system. Software-GRAF HMI Provide support for the Soft-GRAF HMI. The user can design the HMI screen using the Soft-GRAF Studio on the PC and then download it to the PAC to display the HMI on the PAC.